Hand-dyed brocade is enjoying a boom among West African designers as it becomes the most popular fabric on the catwalk. The soft, hand-dyed, 100% cotton textile is a fashion favourite among high-end designers due to its soft feel and elegant texture that lends itself to a number of garments. Much of today’s brocade is produced in Mali, where an estimated 250,000 people are employed in the industry in the capital, Bamako. The textiles industry is a survivor of the economic crash following the nation’s political crisis of 2012. Those working in the brocade manufacturing industry in Mali are mainly women. It’s a striking image seeing them at work, first bent over the large basins of dye and then removing the brocade, spreading it out to dry, creating a beautiful patchwork blanket on the floor. Many brocade manufacturers in Mali still stand by the centuries-old tradition of using plants, mud and natural soda ash as part of their dying process, although modern chemical dyes have also crept into the industry. Other producers outside of Africa include Austria, Germany and the Czech Republic. In recent years, China has also emerged as a major manufacturer of brocade. The manufacturers will say it’s a secret how they create the wonderful colourful effects with the dyes, although it’s widely speculated that the key to the various finishes is the speed at which the dyes dry. There are many specialist skills involved in the manufacture of dyed brocade to achieve its stunning finish. These include embroidery, knotting, wax-stamping, painting and dying. The patterns and textures of the different weaves may look similar to the untrained eye, but to brocade-lovers and people in the textiles industry, they all have unique features. 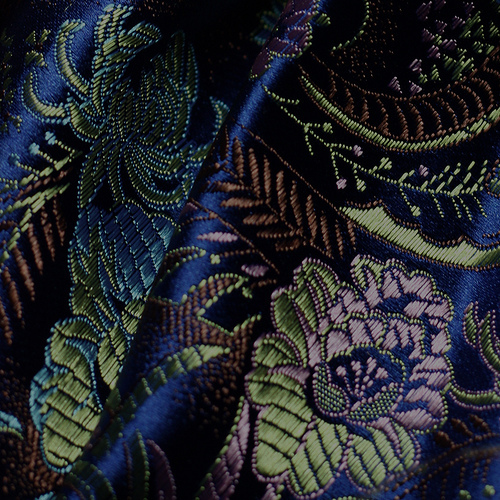 Dyed brocade is renowned for its large, yet sophisticated, patterns and smooth finish. The cloth should feel velvety, yet look crisp. Brocade-wearing seems to follow trends, as with everything in the fashion industry. The top catwalk colours at present include two-tone purple brocade and white brocade that has been wax-stamped and hand-painted. Here at Empire Textiles, we have a beautiful selection of brocade for every occasion. Browse some of our stunning fabrics today.